An organization has the potential to be a vibrant, knowledge commons. As in the age-old village where people developed a collective identity, fostered meaningful relationships, participated in engaging community dialogues, and helped each other solve problems, an organization can be a web of conversations and supportive networks. Rooted in the mutual commitment to the success of the whole, it can be a diverse community that applies its collective intelligence to achieving its mission, serving its customers, and obtaining competitive advantage in a socially responsible and sustainable manner. As explored in previous posts, the workplace is shifting from information processing to strategically managing knowledge with communities of practice and interactive networks that foster innovation—all pivotal elements of organizational learning and decision making. In light of this perspective, an organization’s information technology (or IT) department and its chief information officer (or CIO) not only play a vital role in the organization’s overall operation, but also in devising the organization’s communication dynamics and knowledge-sharing culture. 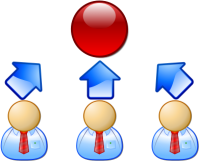 In addition to maintaining an organization’s technical infrastructure, IT professionals must also focus on establishing social networks that generate knowledge, promote learning and enable innovative decisions be implemented, which has been brought on by the current shift to a knowledge-sharing, collaborative work environment. The role of these “second generation” IT professionals is to develop cyber-based processes that tap into and enhance an organization’s intelligence. Such IT specialists strive to design collaborative virtual environments and knowledge management systems that create conversational networks, support teamwork, and foster experiential learning. The challenge, though, as Kristina Höök, David Benyon, and Alan J. Munro point out in 2003’s Designing Information Spaces: A Social Navigation Approach is to create information places that are authentic meeting places that facilitate human interaction and learning. IT professionals, then, are increasingly becoming information systems (or IS) specialists who are communication and knowledge-network architects. Such a viewpoint emphasizes their vital role in fashioning the organization into a knowledge commons characterized by reflective thinking and dialogue rooted in interactive relationships. As information systems managers, network administrators and database managers, IS professionals are information gatekeepers who enable information to openly travel throughout the organization’s communication channels. As knowledge management facilitators, they are architects of the cyber-social networks and communities that enable dialogue and innovative thinking. 2. enable information to flow openly. Information systems design focuses less on data storage and access, and more on enabling employees to form work relationships that are platforms for them to ask questions, identify answers, dialogue, analyze, advise, and provide feedback to each other. Issues regarding locale, distance, time zones, gender, language, cultural heritage, job position, professional status, and organizational politics must be addressed so they are not hindrances to the networking process. Communication and information systems implemented must fit the users’ work habits, preferred communication styles, learning styles, technology level, and particular job needs. As is easily observed, in most cases, employees are knowledge workers. Because of this, the role of the CIO and the IT department are strategic. While it is important that the chief executive officer promote an organizational culture that values knowledge and learning and the human resource management director develops leaders that enable knowledge sharing and creative thinking, the CIO must envision and implement a human-centric information systems infrastructure that can be the technical backbone for the organization’s communication and knowledge generation avenues. All three of these leaders, in conjunction with their staffs, must work as partners in being architects of a knowledge ecology that flourishes in being an organizational knowledge commons. Together they enable the organization to be an innovative open workplace environment comprised of knowledge sharing processes and networks.